For many years one of our dreams has been to become self-sustaining. During the summer of 2014, four volunteers pooled their resources and a downpayment on 12 acres of land was purchased for Savior Children Foundation. The land has been cleared and seeded and we now have our first crop of corn. 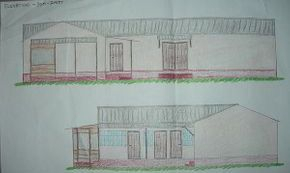 This fledgling farm will enable the orphanage to begin its road to long term sustainability. The surplus produce will be sold at the local market and the profits will be used for the childrens' secondary education. With the purchase of the farmland we now have the ability to grow food for the children. The added benefit is providing a sustainable future for them. The children help farm the land providing them with new skills for their own lives. 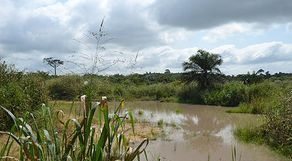 With it's own water source crops can be planted even during the dry season. All excess vegetables harvested will be sold at the market and the profits will go towards the childrens' secondary and post-secondary education. When a child's future is changed the whole community's future is changed. This project cost about 11,000 Cedis, approximately $3666.00 U.S. Donations are appreciated to maintain the farm's viability. Now that the farm has been acquired it important to build a farmhouse on the land. It will cost approximately 26,100 Cedis, about $8700 (USD). The farmhouse will be a place for the farm manager to live and an important place to sort and store the produce as it is harvested. The children love to work at the farm. This will give them a place to stay on weekends and during their school holidays when they will work in the fields and harvest the crops. 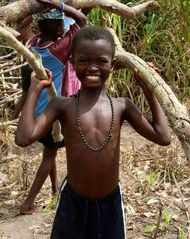 It is an unfortunate truth, but the children at Savior Childrens Foundation still lack a steady diet of protein. The addition of a fish farm will go far to improve the children's diet. Excess fish will also be sold in the market and like the vegetables the profits will go towards the childrens' secondary and post-secondary education. The farmland is currently a 30 minute ride from Savior Children Foundation. It is not an easy task to make the trip to work the land as it means a trip to Kasoa to negotiate the use of a tro tro (small mini bus) that will transport the children and farm equipment to the farm. Because space is limited on the tro tro, not all the children are able to go to the farm to help out. A purchase of the bus will ensure all the children have the ability to be transported to and from the the farm. It will be a means of hauling produce and farm equipment. An added bonus of a bus purchase will be weekend getaways for the children. This could mean a trip to Ghana's capital Accra, trips to the beach, or even to the historical City of Cape Coast.